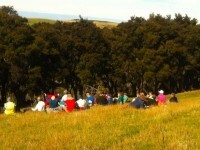 23 km from car park. 1/4/2015. Both. Neehoff Farm, Hindon. M. Leaders: Ian F and Arthur H.
On down the right gully now this time and into the main one across its foot, left skirting its side and crossing at a bridge and struggling up the slope directly ahead. (Red spots about 1.6 kms on GPS map.) Then it was on, up to our left, climbing gradually for the most part, through a number of paddocks and gates, until by various turns we reached what appeared a paper road. 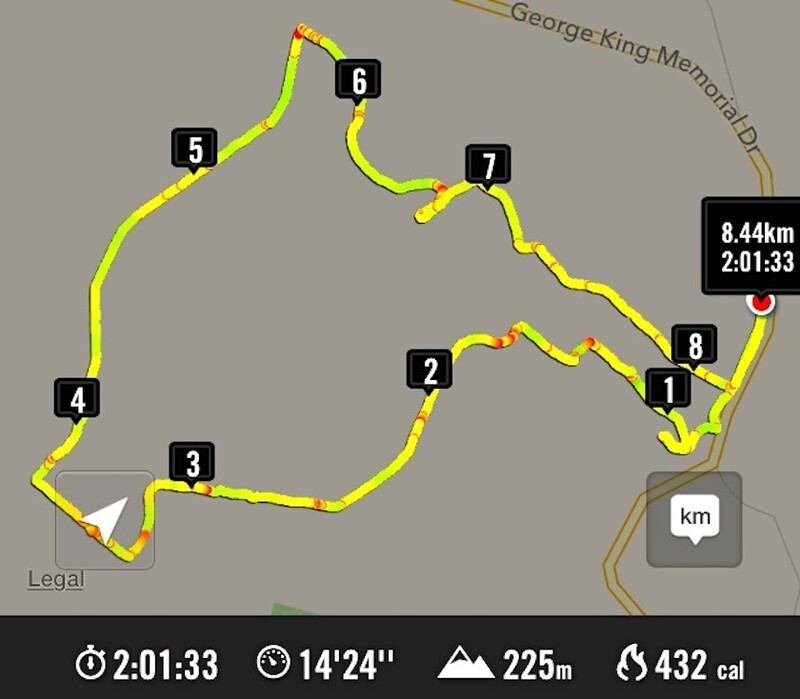 (About 3.7 kms on GPS map.) This formed a long ascending route to the point where we turned into a paddock again. (About 5.8 kms on the GPS map.) En route, we met up with the Neeehoff farm’s neighbouring owner. He reassured us he had been consulted, but it now became apparent that we had spent more time on his farm than the other! Ah well, another permission to prudently seek next time. It was in the new paddock that the mushroom pickers got really busy. There had been some mushrooms in the first paddocks, but here their number appeared endless. This led to a prolonged hunt by the aficionados while most went on to stop for lunch not too distant from one particular loiterer who shall remain unnamed. 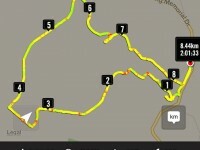 (6.1 kms on the GPS map.) Some great mushroom fry-ups would be on the menu that evening! Lunch stop, waiting for the mushroom pickers to catch up. Around the head of the gully facing the luncheon eaters, we descended to the big gully again, but here bridgeless, with its water-way just a step (or more in some places) too wide. Many just plunged through, but the tail on the GPS map indicates a walk upstream for the few patient enough to wait to be led to the only dry one-step crossing. (About 6.7 kms on the GPS map.) From there we had to walk back along to our left and the corner of a paddock ahead, and wait for leader Arthur to switch off the hot wire of what we now knew to be the Neehoff boundary fence. (About 6.9 kms on the GPS map.) Once through the fence, ahead lay the long steep slog up the longest and principle of all those six ridges leading back up again, – also the nearest to the homestead. (Kms 7 and 8 on the GPS map.) Now we were back up onto the original paddock and soon back to the cars. 20/2/2013. Trampers. Neehoff Farm, Hindon. 22/2/1995. Neehoff Farm, Hindon. Medium. Leaders: Molly, Jack and Rosemary, Eleanor.